In most jurisdictions, the primary (and often the sole) test for whether a product has been defectively designed is whether the risks posed by that design outweigh any benefits it may have (cleverly known as the "risk-benefit test"). The plaintiff typically must show there was a safer alternative design, and then the factfinder compares the two and considers various factors in the course of evaluating the manufacturer's decision to choose the design it actually used. At first glance, this does not seem to be the best possible placement of the pressure gauge on an air pistol, because reading it seems to require you to point the gun at your face. And if the pressure reading isn't zero, that first glance might be your last, at least out of that eye. Cory at Boing Boing and the original poster both see this as a problem. 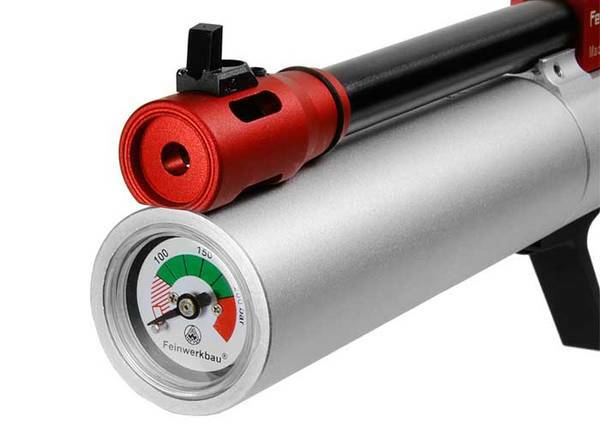 Others, though, have pointed out that the gas cylinder on which the gauge is mounted is removable, and the gauge is not intended to be used while it is actually mounted on the gun. And this does appear to be a very common design, at least for pistols used in competition. Presumably, in that situation we'd be dealing with people who know enough about guns to know you shouldn't point them at your face. Unless there is a competitive face-shooting league, which seems unlikely. Expert testimony is generally if not always required when evaluating a risk-benefit claim, and I certainly don't know enough about the design considerations here to draw a final conclusion. Can this really be the only place to put a pressure gauge on an air pistol? In some models, the cylinder is in the grip, not under the barrel, so there is an alternative design — but maybe there's some good reason that competition pistols have to be designed this way. If not, then the manufacturer might have a problem. This depends on the jurisdiction, though. In many places, a manufacturer could argue that regardless of the design, a person ought to know not to point a gun at his face. But in some (just picking at random here, but let's say California), basic intelligence tests of this kind don't seem to be necessarily required. And having seen some of the warnings people claim they should have been given, I would not be too surprised to see somebody argue that the cylinder should have said "WARNING: DO NOT POINT GUN AT FACE." See, e.g., "Warning: Sharp Thing May Cut Hand," Lowering the Bar (July 26, 2010). If anyone happens to see a professional air-gun shooter wearing an eyepatch, please let me know if he has an opinion on this matter.